Supplier & Distributor of Water Distribution System. Our product range also comprises of Cooling Tower Spares, Maintenance And Repair and Flow Cooling Tower. We are engaged in offering the most sought after range of Water Distribution System.In Round Cooling Tower, the specially designed rotary sprinkler head is made of aluminum alloy to avoid corrosion, also fitted with sealed ball bearings to take care of thrust & radial loads. Sprinkler Unit, which rotates through Inlet Water pressure, Distribution of water is uniform throughout the fill Area. 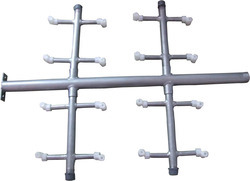 In Square cooling tower: static water distribution system made of GI/PVC pipe with multiple branch arms and nonclogging PP spray nozzles for low-pressure drop and uniform water distribution throughout the fill area. Looking for Water Distribution System ?